This laidback way of thinking helped us a lot and made it easy to find our way to the backpacker community and get in contact with other travellers from allover. We hopped on a boat with some girls from Sweden who invited us to their 'camp' on Mana Island a beautiful bounty island that belongs to the Mamanuca Islands lying to the west of Nadi and just as popular. We sayed here for a couple of weeks turning Mana Island into our second home in Fiji where we met new people and had some crazy nights on the beach. 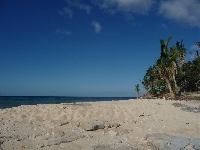 We also travelled to smaller island resorts like Kuata and so on, there's paradiso everwhere you look! Did you enjoy Fiji backpacker island hopping and have you been on a holiday in Mana Island, Fiji?